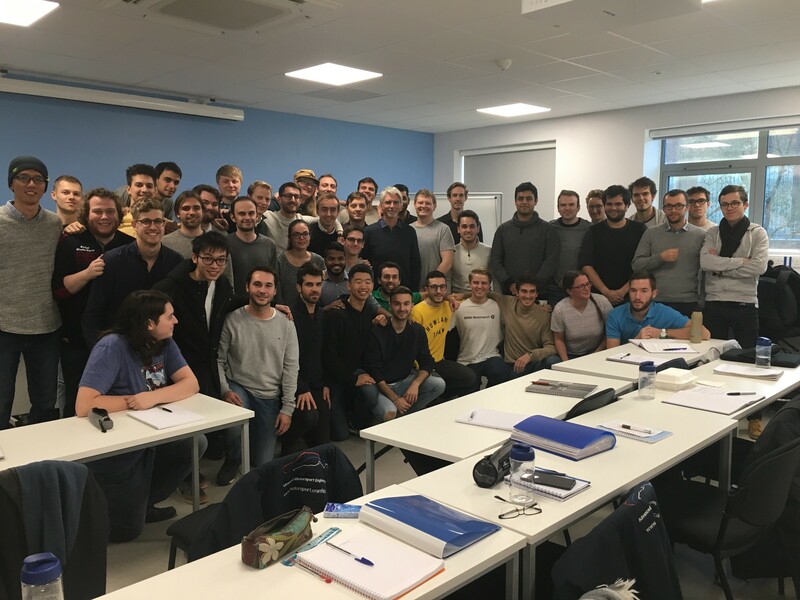 After a hectic two months studying his Advanced Motorsport Engineering MSc, Carlos Soteras Escamez reflects back on the exams, endless days at the library, and exciting trips and visits that have taken place so far during this popular Cranfield course. It is not until you stop and think that you realise how quickly time passes. Over the past two months, I’ve had the privilege of visiting the five times consecutive Formula One World Champions – Mercedes AMG F1 team – in Brackley, and have met one of the most respected British F1 drivers of all time, Damon Hill. The visit to Brackley, just 50 miles from Cranfield, was undoubtedly the most anticipated dates in the diary for myself and my Advanced Motorsport Engineering MSc classmates. 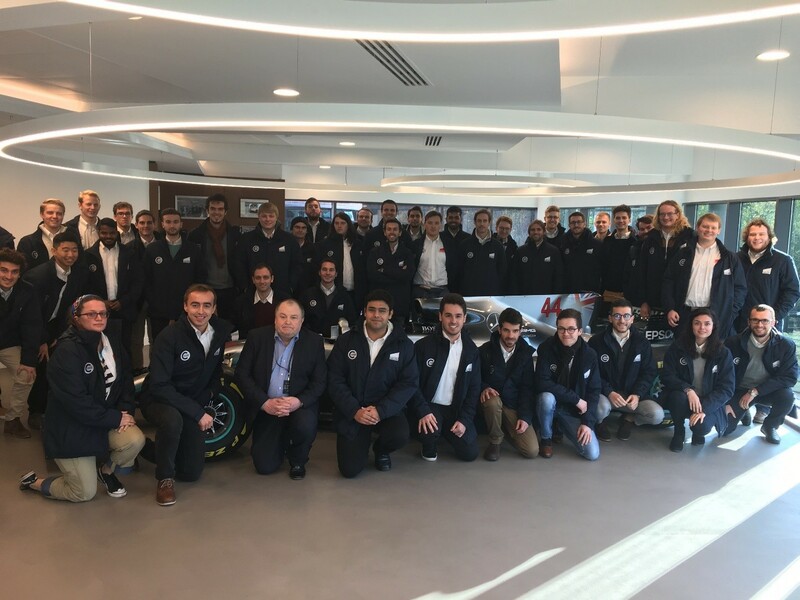 Whilst visiting the five times consecutive Formula One World Champions, we had the chance to talk with employees linked to every aspect of Motorsport – not just engineering. This included finance, human resources and even sponsorship. However, the best was James Allison, Technical Director of Mercedes-AMG Petronas Motorsport. James has had leading roles at the biggest Motorsport teams in Formula One including Benetton, Renault and Ferrari, and is one of the most respected names in the sport. We didn’t have time to visit the full factory, but will be returning in July to see the best team in the planet! In all truthfulness, everything about the course so far has been great – including the lecturers and modules linked to the Motorsport industry. We’ve also had some top engineers, journalists, drivers and industry experts visit us here at Cranfield – including some of the most renowned names in Motorsport. This is all made possible by our fantastic teaching team, who have some of the best connections, to give us the opportunity to get involved in real-life challenges in Motorsport. However, this testing course isn’t all fun and games as a lot of my time has been dedicated to studying! I’ve had to work extremely hard and have spent a lot of time in front of a computer in the library – but this isn’t so bad – as I’m learning about something I love. After visiting one of the greatest Motorsport organisations in the world, we were also recently treated to a visit from one of the greatest drivers ever too, Damon Hill, 1996 Formula One world champion. This is another perk to studying this MSc, as you get the chance to meet those who work ‘behind the scenes’, those who are the ‘faces’ of the industry, and the more cold-hearted, economic side of big enterprises. When someone like Damon walks through the door, you don’t know how to react. I didn’t know if he would be arrogant – or even boastful – like some successful individuals are about their career; or if he would be a nice, charming, down to earth guy. After a couple of seconds, I realised it was the latter! The time with Damon was spent well – with an hours’ question and answer session – led by Mark Jenkins, Professor of Business Strategy. If I had to choose another highlight about the course, it would have to be the people I’m studying alongside. They’re all tremendously entertaining, friendly, and if you sum this up with their intelligence, you get some interesting questions. Due to this, during Damon’s Q&A, he had to pause and think for a while before answering! I’ll be studying my Advanced Motorsport Engineering MSc until September 2019 and am sure the time will pass quicker than one of the Silver Arrows – one of Mercedes Benz’s most powerful cars in the 1930’s. It’s going to be a busy 2019 with very little breaks – my next will be during the Christmas period – but I’m also thinking about booking a trip to the Isle of Man to watch the thrilling Tourist Trophy competition in June. For now, that’s all, but I’ll keep you updated on what we’re getting up to on our course. Find out more about our Advanced Motorsport Engineering MSc.